From January 9 to 22, 2020, the canton of Vaud will host the 3rd edition of the Youth Olympic Games (YOG). “Compete, learn and share!” These are the values of the YOG and Lausanne 2020. This sports event is the world’s most important of its kind. It is reserved for athletes aged 15 to 18 years from approx. 70 countries. Lausanne, the capital of Olympism and of the canton of Vaud, as well as the ski areas hosting these games aim to bring together the local population around this event. This Olympic sports event is also a springboard for the young athletes who will be the elite athletes of tomorrow. The Youth Olympic Games give them, their families and the public the opportunity to discover the treasures and the winter activities in the canton of Vaud. These new developments and events will be available to them and visitors to the region from this winter and for the years to come. The organisation of Lausanne 2020 involves more than 3,000 volunteers in the eight sites. In the Vaudois Alps and the Vaudois Jura these volunteers are committing themselves to this event as of now to highlight the assets of the destinations hosting the Youth Olympic Games. Lausanne, Villars-Les Diablerets, Leysin-Les Mosses and Vallée de Joux have already started preparing for the Olympic Games. The canton’s four hosting sites are improving their facilities and organising test runs in order to be ready for January 2020. Since 1994 Lausanne has been the capital of Olympism and is also the headquarters of the International Oympic Committee (IOC). The city is the home of the Olympic Museum that attracts hundreds of thousands of visitors from around the world each year. About fifty sports organizations and international federations also have their headquarters here. Lausanne 2020 lent itself naturally to hosting the Youth Olympic Games. The Olympic Village of Lausanne 2020 will be set up in an impressive circular building called Vortex. Built in the heart of the university campus near Lake Geneva, this architectural work will accommodate more than a thousand athletes during the YOG. The student city will assume its rightful role of Olympic and sports capital during the YOG 2020. The ice sports (speed skating, ice hockey and figure skating) will be held in the new Espace Malley. At the end of the competitions, the athletes will receive their medals on Place des Médailles in the heart of the Flon quarter. This lively and festive quarter reflects the very essence of Lausanne. The shops, restaurants and nightlife around the square will transform into a friendly meeting place offering exchanges between the young athletes, their families and the general public. This event will put Lausanne on the map of the world! Ian Logan, what contribution will Lausanne 2020 make to the region? This event will put Lausanne on the map of the world. The athletes will become aware that the city is not only the administrative and Olympic capital but also a place where you can practice all kinds of sports. And will this appeal to the young? Certainly. It’s not by chance that the Olympic Village is on the uni campus! Lausanne is a lively student town. It serves as a magnet and the centre of the event. There will be a ski slope in Les Diablerets and a cross-country slope in Vallée de Joux. There will also be an ice rink and an Olympic pool in Malley stadium. All these facilities created around the Lausanne 2020 event will turn into a permanent feature to be enjoyed by everyone. Hearing you say this makes me want to say that Lausanne 2020 has already started! It has. Lausanne 2020 is a fantastic opportunity to highlight our strengths - our landscapes, energy, and creativity – as well as the proximity of facilities in the canton of Vaud. Even the airport is nearby! This sports event also puts things in a larger context, not only on an urban or cantonal level, but also on a Swiss one. This is a great asset in our interconnected world, where getting about has become so easy. 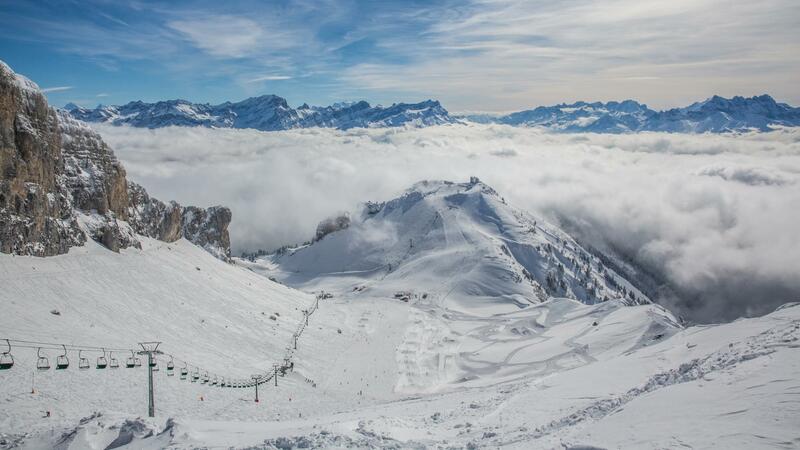 In the Vaudois Alps, Villars-Les Diablerets is a skiing paradise for the whole family. The youngest will have a go at their first downhill skiing practice in the kids’ winter gardens. Maybe they’ll even dream of emulating Villars-born Fanny Smith, the world skicross champion. Preparing the ski areas is therefore of the utmost importance. Tim Vodoz, a driver of a snow groomer in the ski area of Villars-Les Diablerets, makes sure they're in perfect condition. He knows the slopes like the back of his hand. Children become quickly familiar with this ski area. They soon feel at home on them. Tim Vodoz, driver of a snow groomer in Villars-Les Diablerets. During the Youth Olympic Games 2020, he and his colleagues will prepare the slopes where the snowboard/cross and downhill skiing events will be held. Fans of winter sports will be delighted to use the brand-new cable car in Les Diablerets. Its name “Diablerets Express” reflects its speed. It takes skiers to the Jorasse slope, which has been enlarged in view of the forthcoming ski competitions. This downhill slope is lit at night. A magical experience open to all once the young athletes’ night training sessions are over. This winter, the destination of Villars-Les Diablerets is organising major sports events. They serve to test the infrastructure. The Women’s Combined Alpine Ski European Cup and the Super G will take place on January 28 and 29, 2019 in Les Diablerets. Villars will host the European Skicross Cup from January 11 to 13, 2019 as well as the World Ski Championships from March 9 to 16, 2019. There are several attractions in the ski area of Leysin-Les Mosses. Among them are the famous revolving restaurant Kuklos with its unrestricted view of the Alpine summits and the Tobogganing Park where thrills are guaranteed. The one and only half-pipe in the Vaudois Alps will be open to the public from this winter. Freestyle fans of all ages will be delighted to use this facility that has been custom-built for Lausanne 2020. This is where Leysin will host the freestyle skiing and snowboarding events (half-pipe and slopestyle). Benjamin Ravanel, is it true that the region is gaining a foothold in the field of freestyle? Absolutely! This is also one of the reasons why the design and maintenance of the snow parks has been entrusted to professionals from this year. But there is nothing elitist about it. There is something for every level, from 7 to 77 years, including for beginners! A grandfather may want to have a go at banked corners with his grandson, for example. Its length of 160 metres and height of 7 metres conforms to FIS standards and allows for competitions. Incidentally, we will be hosting the world half-pipe championships from now on. The facility should be operational and open to the public by 20 January. What are the region’s main assets in your opinion? Much has been invested in mechanical snow-making systems in the snow parks this year, with a view to Lausanne 2020. But visitors will be able to enjoy all of that well beyond the event. There is the incredible view, for one! Especially from the Kuklos, the famous revolving restaurant. Its accessibility by train is another asset: no need to drive to Leysin! As an appetizer, the Leysin Freestyle Open will be held from January 25 to 27, 2019, featuring the national Elite and U15 competitions of the Swiss Freeski Tour. In winter, Vallée de Joux resembles the Far North. Lac de Joux turns into a “natural ice rink” surrounded by forests. This view is even more spectacular from Dent de Vaulion, the region’s most emblematic summit. Lausanne 2020 will give the young athletes the opportunity to discover these wonderful slopes in preserved nature. There’s now even a slope in her honour, called “La Coriace” (the tough one). “Its name is fitting because it’s difficult and steep. The track crosses the forest of Risoud, and that’s unique! Snow conditions are usually excellent there.” The future cross-country slope of Lausanne 2020 will be built in the same area and will be just as demanding. On March 2 and 3, 2019, Vallée de Joux will be hosting the OPA Games, a major sports event for athletes aged below 18 years. This will be the opportunity to test the infrastructure for the forthcoming YOG. The Youth Olympic Games stand for sports but also fun and recreation. Create a paper figure with your own hands - a pastime both children and grownups enjoy. Download and print the document below. 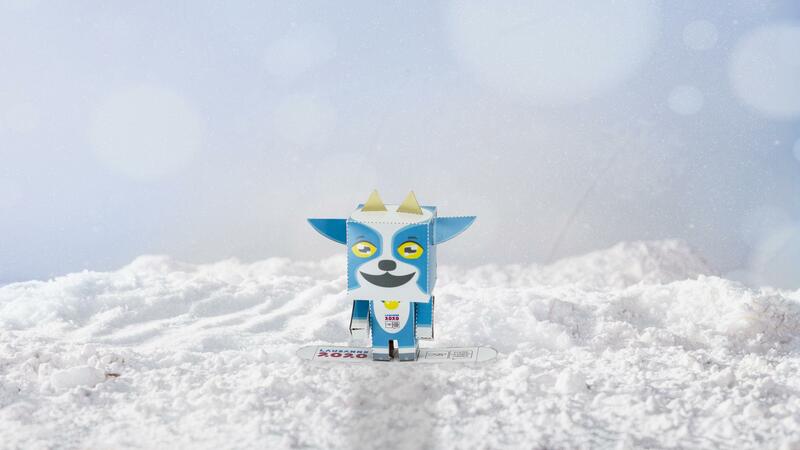 All you need after that is a pair of scissors, glue and a bit of patience to assemble “Yodli”, the famous mascot of the YOG. Perhaps they will even decorate your desk or shelves?